Aspartame is blindly consumed by many of my friends. Most of them don’t want to get fat. One of them wants to be able to drink soda constantly throughout the day (I’m guessing he gets full from normal soda after the first 12, I’m writing this for him). NutraSweet, the great-tasting, low-calorie artificial sugar substitute sweetener made with aspartame..
Ok, this is probably old news. But I think it needs a #rehash. I always buy sugar-free gum (wishing they sold unsweetened gum). I usually stay away from soda in general, but occasionally I’ll drink a diet soda if that’s the only thing in someone’s fridge. 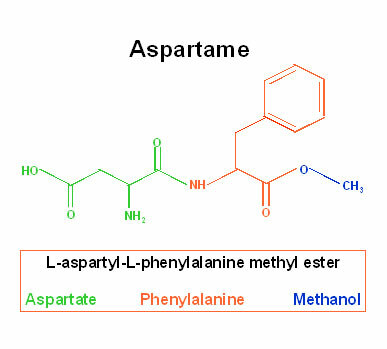 Even though I know Aspartame breaks down to methanol when metabolized! In fact, I’m drinking a diet cherry cola right now. What .. are we all stupid? Aspartame was discovered in the 60s by a chemist. While working in the lab, he unknowingly got some on his hand and some how it got into his mouth. He thought, “sweet!” and the rest you can read on Wikipedia. Aspartate and Phenylalanine are amino acids, no big deal. But notice Methanol a.k.a. Methyl alcohol or wood alcohol? Its highly poisonous! AND NOT to be mistaken with Ethanol, the kind we drink in hot tubs. Below you will find a 90-minute documentary on Aspartame, called Sweet Misery: A Poisoned World . ALL of you should watch the first 10 minutes. Think I’m buying into propaganda or unfounded conspiracy theory? And makes you pee a lot!